Broccoli with Garlic Chips, Thyme for Cooking winter vegetables. Fry the garlic until it is a lovely golden brown. The little chips are very tasty; not at all sharp like raw garlic, but not creamy like roasted. If you prefer less garlic, just use the flavored oil - and let someone else munch on the chips. Cut broccoli into small florets and stems. Put in a steamer basket in a saucepan with an inch of water in bottom. Put on medium heat and steam for 8 - 10 minutes or until just done. Remove from pan and put into a serving dish. 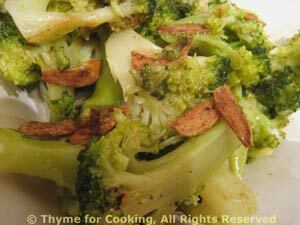 Pour oil over the broccoli, sprinkle with garlic chips and serve. For garlic chips: Slice garlic as thinly as you can (peel it first - but you know that). Put olive oil in a small frying pan and, over medium heat, fry garlic chips until brown and very crisp, - about 10 minutes. Mind them so they don't burn. Remove chips and drain on paper towels. Keep oil warm until needed.